BUCYRUS, Ohio — Pfeifer Dairy is truly a family affair. When the Pfeifer family made the decision to increase the milking herd on their Crawford County farm in 2012, from 300 head to over 500, they did it with the next generation in mind. “We never pushed our kids to be a part of the farm,” said Jenny Lynne Pfeifer. But after her husband, Ed, had to have back surgery in 2013, their son, Mark, took on the challenge. “It was a neat way for Mark to discover if working on the farm was what he wanted to do,” she said. “I like working with the milk cows and the field work,” said Mark, 20, who helps his father with breeding and herd management. 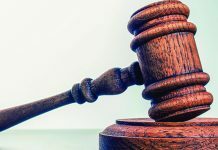 “I do really anything Dad and Kent do,” he said, which loosely translates to, when Mark is home from college, he is taking on any jobs his father and uncle, Kent Stuckey, have for him. Mark is not the only next-generation family member rising to the occasion. His cousin, Zack Stuckey, 21, has taken charge of the calf operation on the farm. “I call myself the calf manager,” said Zack, who coordinated the addition of a new calf and heifer facility, completed earlier this year. The calf and heifer barn, the newest of facilities at Pfeifer Dairy was completed in early 2016 and can house over 250 head. The new facility replaces a handful of rented barns that were located anywhere from 1-6 miles away. The barn houses over 250 head, and replaces a handful of rented barns located anywhere from 1 mile to 6 miles away. “Zack did all the math (on this facility),” said his father, Kent Stuckey. “This barn will pay off in seven to eight years with labor savings,” and rent savings. The calf facility is just one of the new additions that have come to the farm in the last few years. 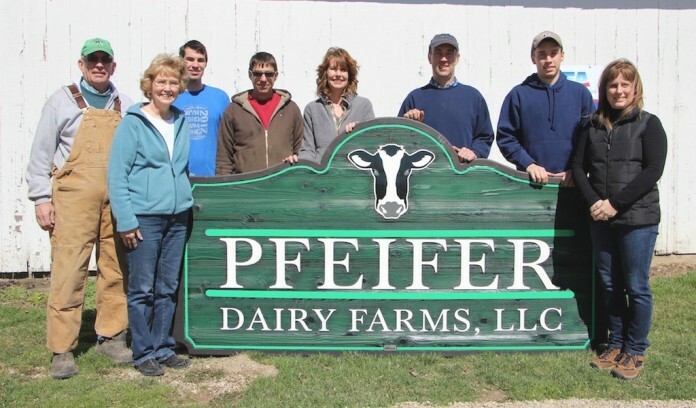 Pfeifer Dairy has been a family-run operation for almost 115 years. Established in 1902 by Edward Pfeifer, the dairy is now into its fourth and fifth generations working on the farm. 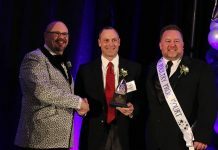 “I started farming with my dad once I could walk,” said Chuck Pfeifer, who says he is semi-retired from the dairy and leaves most of the work to his son, Ed; son-in-law, Kent; and their children. 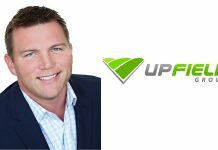 The farm is a partnership between Kent and Ed Pfeifer. Ed manages the cows and “everything that entails,” mainly herd health and nutrition, breeding and employee management. The Pfeifers have around 1,150 head of Holstein, Montbéliarde and Swedish Red crosses. “All growth has been within in our herd,” said Ed, who attributes that growth to cross-breeding. He chose the unusual breeds based on their longevity and highbred vigor. 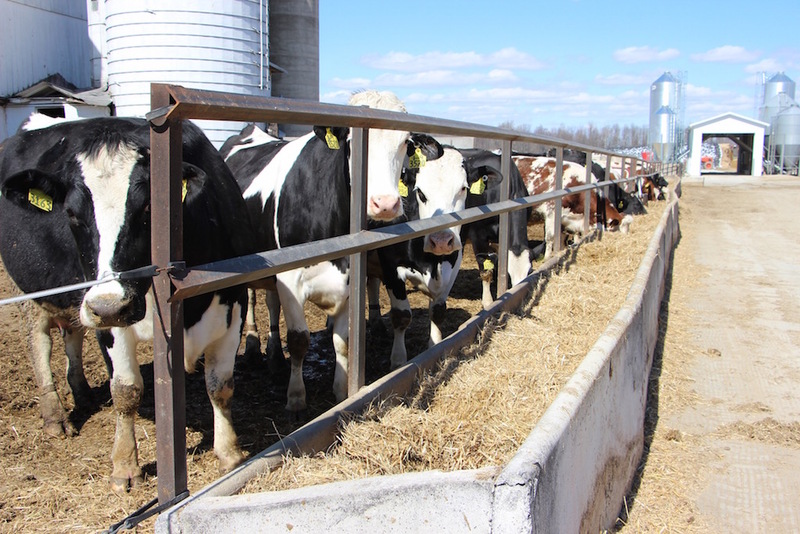 “The production may not be as much” — milking three times a day and producing around 80 pounds of milk per cow, per day — ”but breeding has made better growth (in our herd).” It has also contributed to a lower cull rate. When Pfeifer Dairy increased its herd size, two new freestall barns were built to accommodate the growth. 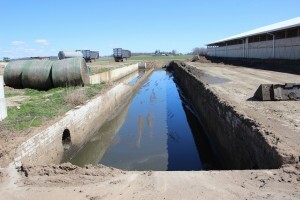 This sand lane was incorporated with the first freestall in 2012 and allows the dairy to recycle up to 90 percent of the sand used in the freestalls. 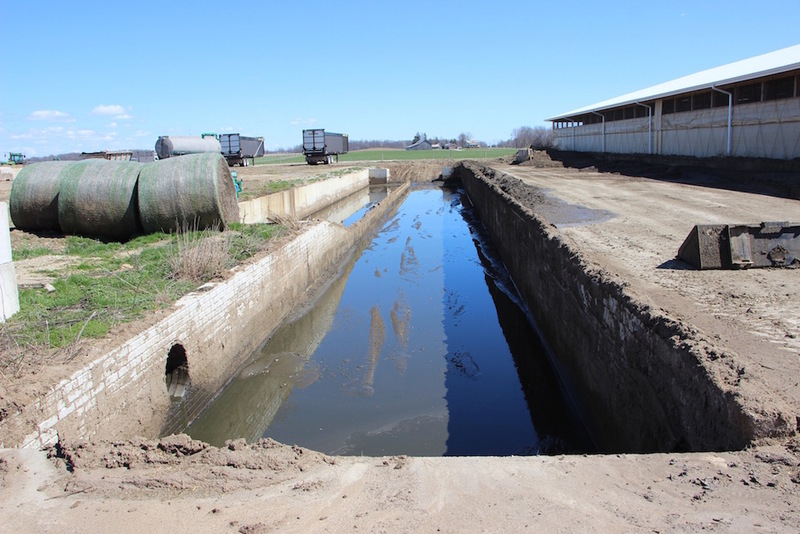 Water runs back and fourth through the sand, filtering out manure and leaving the sand clean. A big adjustment in cattle inventory called for a big adjustment in housing and storage space, which is what has kept the Pfeifer family busy the past few years. 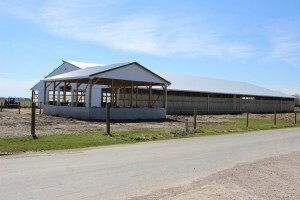 The first freestall barn, built in 1994, is still in use, but once the herd size began to increase, the first of two new freestall barns went up in 2012. 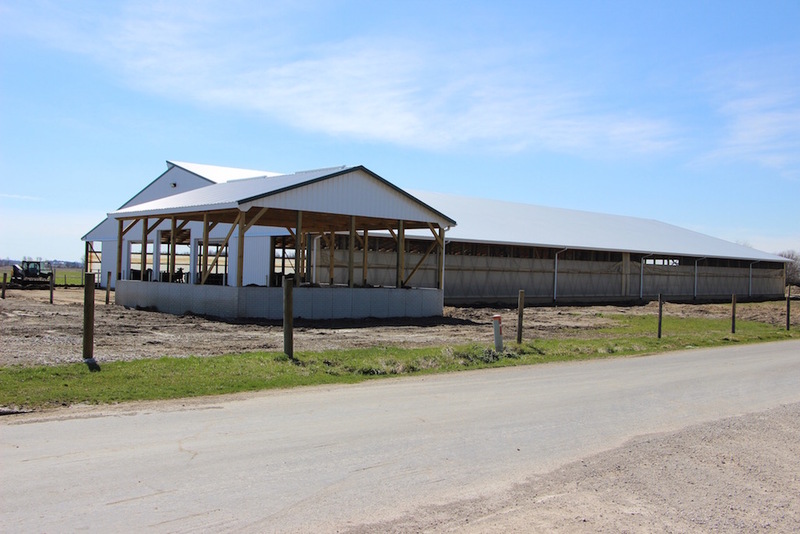 A third freestall barn was completed in 2014, with each new barn housing up to 200 head. When the new freestalls were built, a sand lane was put in. Sand is scraped into a piping system and flushed out of the barn with water into the pit outside the barns. Water continues to run back and forth until the sand is clean. Ed said they are able to recover 90 percent of the sand they use through this process. The milking parlor, which was also built in ’94, has had a few upgrades over the years to accommodate herd growth. A 6,000-gallon bulk tank was put in and the double three herringbone parlor was upgraded to a double twelve. Built in the fall of 2015, this grain facility allows workers to load wagons in a sheltered station out of the winds that frequent the flat landscape of Crawford County. The grain mill is one of the many improvements Pfeifer Dairy has made to its operation since increasing its herd size in 2012. More animals also means more feed that needs to be stored somewhere. 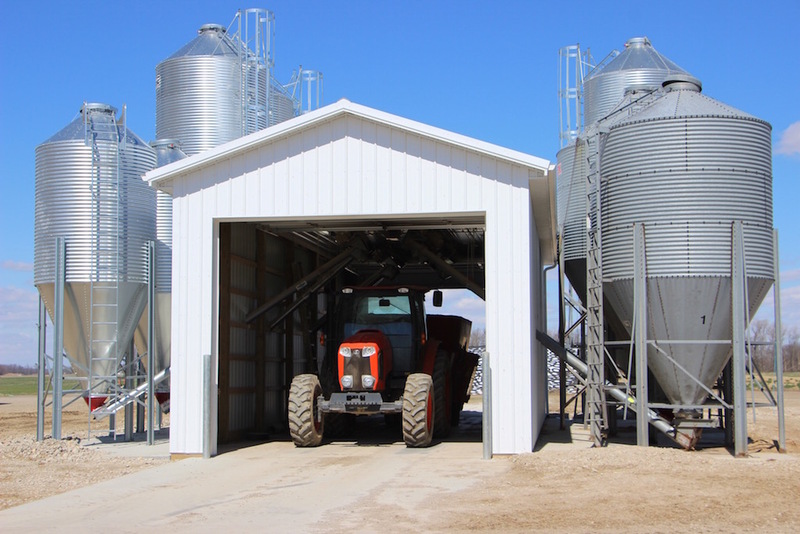 An extra storage shed was built in the fall of 2015, along with a grain mill, that allows workers to fill wagons in a sheltered station — out of the winds that can blow pretty fiercely across that flatlands of Crawford County. A board member of the Crawford Soil and Water Conservation District, Kent is a proponent of cover crops on the farm, using mostly cereal rye and annual rye. “Raising cover crops helps tremendously with manure (management) and soil structure,” he said. “I like to see something growing all the times.” And it’s not always the most highly sought-after position on the farm, but someone has to do the book work. 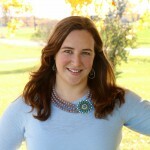 Jenny Lynne heads up the payroll and bookkeeping on the farm, and feeds calves and pitches in wherever she is needed. Jenny Lynne grew up in Salem, Ohio, and didn’t have the farm upbringing her husband did. “Living on the farm is different for me. I studied ag at Ohio State, but I didn’t like it,” she said. “It was a little bit of a challenge at first. The long hours were new to me.” She can remember being so nervous when her husband was working late on the farm when they first got married. “But I’ve learned to embrace the farm life,” she said. And both Jenny Lynne and Laura Stuckey agree, they wouldn’t want to raise their kids any other way. Laura — daughter of Chuck and wife to Kent — grew up feeding calves and “driving all kinds of tractors on the farm,” she said. When Kent and Laura got married, they settled in his home state of Indiana, where his family had an orchard, before moving back to her home farm (Pfeifer Dairy) in 1994. Laura spends most of her time managing the Pickwick Place market in Bucyrus, which she and her husband and two other couples partner on. Their middle son, Ethan, 17, heads up the produce and orchard operation at the market. 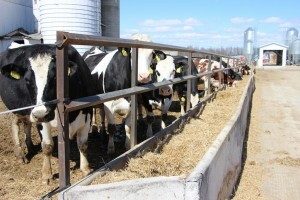 Pfeifer Dairy has built a herd of roughly 1,150 head of unique Holstein, Montbéliarde and Swedish Red crosses. While Ed Pfeifer says the milk production isn’t as high, the crossbred herd growth is strong and cull rates are low. “I can’t think of a better way to raise children (than on a farm). It creates a good work ethic,” she said. A work ethic that has translated into the next generation showing great interest in taking over the farm. Mark says he plans to continue working on the farm full-time once he graduates from the University of Akron (he is currently a sophomore). Ed and Jenny Lynne’s youngest daughter is in sixth grade, and “she says she is going to be a farmer,” said Jenny Lynne. She enjoys taking blood samples alongside her father.